When it comes to growing healthy hair, antioxidants are one of the most essential elements. In this article, you will first learn what antioxidants are and why it’s so important for promoting healthy hair growth. Then, you will find out which tea has the highest antioxidant properties for you to sip in everyday! Before going straight to antioxidants, it’s important to talk about free radicals. While some of these free radicals are from natural chemical reactions of our body turning food into energy, there are also other contributing factors. The problem occurs when free radicals start attacking healthy cells in order to steal their missing electrons. This process affects healthy molecules to become free radicals themselves and causes a negative domino effect to numerous normal and healthy cells. This chain reaction of free radicals is called oxidative stress and causes all kinds of health issues from chronic inflammation such as arthritis, cardiovascular disease, premature aging, an autoimmune disease (alopecia areata being one of them) and contributes to general hair loss by affecting healthy follicle cells. So the question becomes how to stop this free radical activity in our body? That’s where anti-oxidants come in. Antioxidants fight free radicals by providing one of their electrons to free radicals. This helps stabilize free radicals from stealing electrons from other healthy cells and prevents them from causing further cellular damage. Also, it’s important to note that even though antioxidant foods or substances give away their electrons, they don’t become free radicals themselves. In order to measure the antioxidant capacity of food and other substances, scientists use what’s called ORAC (Oxygen radical absorbance capacity) and assign numbers. The higher the number, the more antioxidant capacity the food/substance contains. For instance, one of the reasons acai berry became a new health sensation is due to its amazingly high ORAC value (102,700 – freeze-dried version like this one). As free radicals attack healthy molecules by capturing their electrons, they can also interfere with the normal hair growth cycle by damaging hair follicle cells. According to a study (1), people with hair loss tend to have increased oxidative stress markers such as nitric oxide and lipid peroxidation. Another study shows that oxidative stress is the culprit of inflammation and autoimmune reactions such as alopecia areata. By consuming antioxidant foods, you can prevent free radical activities from continuously damaging our follicle cells. The answer: drinking a tea. While antioxidant foods are great, it’s not easy to have antioxidant rich foods every single day. But you can easily drink a cup of tea in the morning, at work, or even before you go to bed. What’s the most antioxidant tea? Now the most important part – the most antioxidant tea (with easy access) is…. hibiscus tea. Hibiscus tea has an ORAC value of 6990 when its brewed, according to Superfoodly. This amount is TWICE as high compared to macha green tea, which people often think of as the most antioxidant tea (now you know the truth). Hibiscus tea is a rich source of anthocyanins, which gives its bright red/purple color. This powerful antioxidant compound is known for protecting our body against various illnesses. Interestingly enough, Ayurverda, a traditional India medicine practice, recommends using hibiscus for restoring thinning hair. Being the most antioxidant tea is just one part of the game. According to a 2011 study, drinking hibiscus tea twice a day significantly lowered bad cholesterol levels as well as increasing good cholesterol levels. Other claimed benefits include aiding with weight loss, protecting liver health, regulating blood pressure, and promoting healthy immune system. Drinking hibiscus tea is likely to be safe. However, high doses of hibiscus “extract” may cause damage to the liver according to Medical News Today. Also, it’s not recommended for pregnant women. 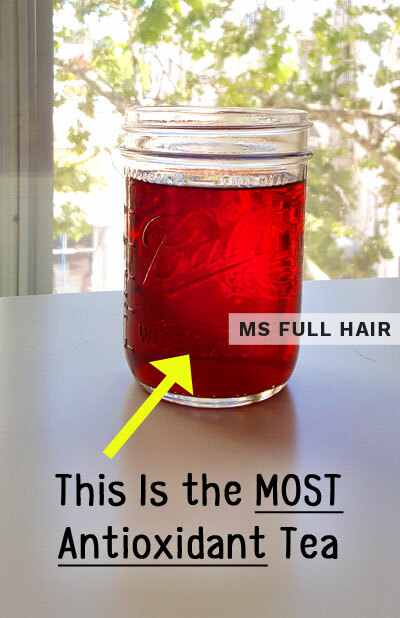 Where can I buy the best hibiscus tea for hair? Go with USDA organic certified tea to get the best quality. This reputable brand offers 6 pack of hibiscus tea (about 100 tea bags) that is both non-GMO and USDA organic certified. This will last you whole 3 months!